Saturday, FEBRUARY 3rd, NORTH CENTRAL COLLEGE, 7:30 p.m.
Psalm 90, verse 4, says, “For a thousand years in your sight are but as yesterday when it is past, or as a watch in the night,” so a 30th Anniversary might not be all that big in the grand scheme of things. But, still, it is—isn’t it? Certainly to us mere mortals. Please come celebrate with us. Exciting music. Passionate Praise. 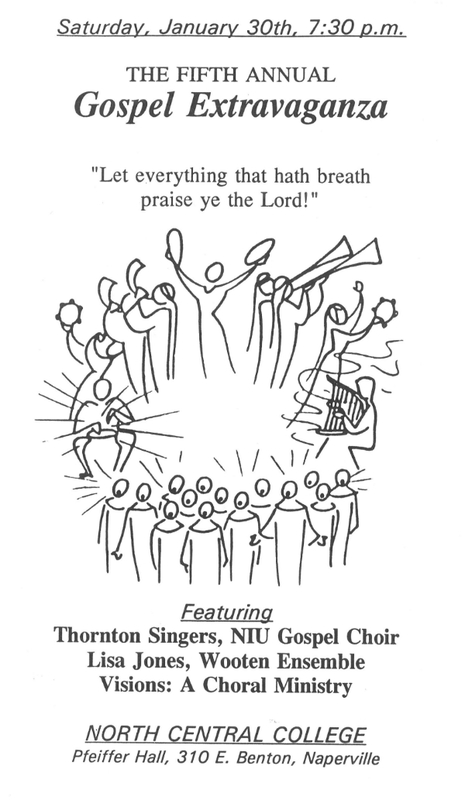 Just over thirty years ago a group of North Central College students asked me to attend a gospel concert they were putting on at a church down the street from campus. 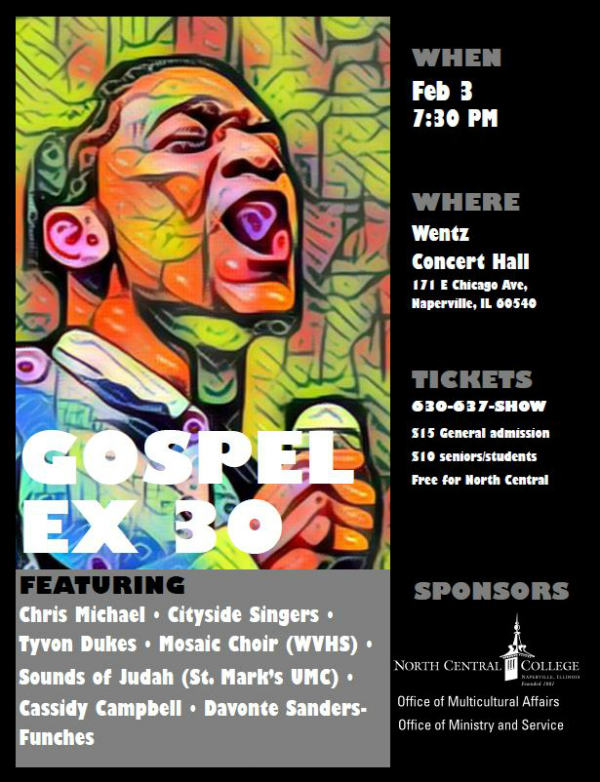 I was director of the college’s Cultural Events program, and afterwards a few of those students asked, “Can you bring this to campus?” I said, Yes, right away, and some months later we held our first Gospel Extravaganza. I’ve written about some of its history elsewhere, and posted videos of our 25th Anniversary and others. Just follow the links at the end of this post. Here’s the program cover I created for our Fifth Anniversary, another milestone that few of us—if any—thought was pointing 25 years into the future. ♦ Read about and watch moments from Gospel Extravaganza 25. This entry was posted in Faith, Music & Meaning and tagged Gospel Extravaganza 30th Anniversary, Gospel music, North Central College. Bookmark the permalink.